Trust me when I say ravioli are a heck of a lot easier to make than you think. Once you have your pasta dough made it's just a matter of filling, sealing and cooking them up. The best part of making your own ravioli is choosing what goes inside. They can be filled with virtually anything so it's easy to get creative. I've made: traditional cheese ravioli, wild mushroom, an artichoke version and even some filled with beef cheek. So when I came across a recipe from the Food Network Kitchen for Bacon Ravioli with Mushrooms I knew I had to try it. 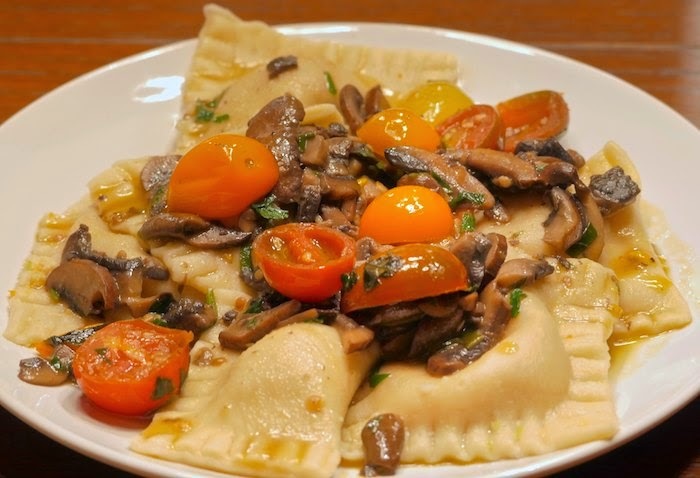 The ravioli are filled with leeks, Gruyere & bacon and served with a tomato mushroom sauce. I will definitely be making them again. Make the dough: Put the flour in a food processor. With the motor running, pour in the beaten eggs and pulse until the dough gathers around the blades. Turn out the dough and pat into a rectangle. Wrap in plastic wrap and set aside 30 minutes at room temperature. Make the filling: Pulse the leeks, bacon and carrots in a food processor until finely chopped. Transfer to a skillet; add 1 cup water and cook over medium heat, stirring, until evaporated, about 7 minutes. Add the nutmeg, 1/2 teaspoon salt and 1/4 teaspoon pepper. Increase the heat to medium high; cook until the vegetables start to brown, about 4 minutes. Transfer to a bowl, stir in the parsley and let cool. Mix in the ricotta, Gruyere and egg yolks; cover and chill until ready to make the ravioli. Dust the dough with flour and cut into 6 pieces. Pat 1 piece of dough into a 4-by-2-inch rectangle (keep the rest covered with plastic wrap). Feed a wide side through a pasta machine at the thickest setting. Continue to feed the dough through the machine, reducing the thickness setting each time, until the pasta is about /16 inch thick. Lay the pasta sheet on flour-dusted pan and cover with a kitchen towel. Repeat with the remaining dough. Uncover 1 sheet of dough; lay out with a long side facing you (keep the remaining sheets covered). Place small mounds of filling, about 2 inches apart, in a line along the bottom edge. Brush the top half of the sheet with water and fold the dough over to cover the filling; press around each mound to seal. Cut into squares with a pizza wheel or chef's knife; transfer to a baking sheet dusted with flour. Repeat with the remaining dough and filling. If not using immediately, wrap the baking sheet in plastic and freeze for up to 3 days. Make the sauce: Melt 3 tablespoons butter in a large skillet over medium-high heat. Add the mushrooms, season with salt and cook, stirring, until tender, about 4 minutes. Add the scallions and garlic; cook, stirring, 1 more minute. Add the tomatoes and cook 4 more minutes. Remove from the heat and stir in the basil and parsley. Cook the ravioli: Bring 3 inches of salted water to a boil in a large pot. Add the ravioli in batches and cook until tender, 8 to 10 minutes. Remove with a slotted spoon and transfer to a baking sheet (reserve the cooking water). Cover the ravioli loosely with foil to keep warm. Add 1 1/2 cups of the ravioli cooking water to the sauce, bring to a simmer and cook until slightly thickened, 2 to 3 minutes. Swirl in the remaining 2 tablespoons butter and season with salt and pepper. Divide the ravioli among plates; top with the sauce. Happy New Year!! Amazing ravioli! Anything filled with bacon is amazing! We love making ravioli and you're right when you say that it really isn't that difficult. This bacon-filled version sounds decadent and beyond delicious! Bacon filled ravioli!?! Genius!! I want some now! I was sold with bacon in the ravioli. Homemade ravioli is on my list of things to try! You have inspired me. Oh wow! Bacon in ravioli topped with mushrooms, this is a dream come true! What a great combo with the Bacon and the leeks! These raviolis came out perfectly and I just love the flavors you used too. You had me at homemade ravioli!! That looks so delicious! Oh my goodness, between that filling and that sauce, this is an amazing flavor overload! Plus, that is a gorgeous plate. Yep, like everyone else you had me at bacon! Quick question, rather than making my own down can I substitute with wonton wrappers? Just curious, thank you! WOW! That's what I call a filling! Sounds delish! Bacon filled ravioli! It's like you know the way right to my heart. You just might have convinced me to finally make my own ravioli! I love ravioli and this one looks flipping fantastic. Making your own is such a fun thing to do. Plus it just tastes so much better. I don't think I have ever had bacon inside ravioli but I do think it's a brilliant idea. So glad you tested this one out for me!! Fantastic. What could be better than bacon! !